Yes, toothpaste does expire, but it won’t hurt you if you use it. However, that doesn’t mean that it’s providing you with the benefits that it should. This is because the active ingredients become less effective over time, causing your brushing routine to lose its power. The FDA and ADA both require toothpastes to have expiration dates on the tube and box, which will usually occur after about 2 years. While expired toothpastes can’t hurt you, research has shown that fluoride will degrade over time. The American Dental Association and Federal Drug Administration require an expiration date to ensure that your teeth stay healthy through routine brushing. 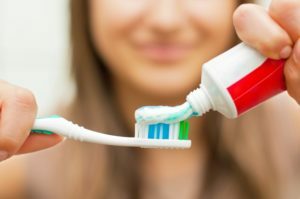 Fluoride is a main ingredient in toothpaste that protects your teeth against cavities and decay because it supports and strengthens your tooth enamel. Your enamel protects the more sensitive inside portion of your tooth from harm and sensitivity, which is why it’s important to keep it healthy with up-to-date toothpaste. Brush your teeth twice a day, for 2 minutes each session. Replace your brush every 3 to 4 months. Avoid sugary snacks throughout the day. Drink water instead of soda or sugary juice. Avoid smoking or using tobacco. Additionally, it’s important that you visit your dentist at least twice during the year for routine checkups and cleanings. These appointments remove plaque and tartar from your smile that couldn’t be cleaned at home, but they also prevent and detect oral health issues from becoming more serious. Use these tips for the best oral healthcare routine, that way you can have a happy and healthy smile year-round. Dr. Angelo M. Julovich is an experienced dentist who enjoys providing quality care to his Zionsville community. He believes in patient education, which is why he wants you to know the importance of keeping your dental products up-to-date. He currently practices at Trinity Dental, and he can be contacted through his website or by phone at (317) 769-3335 for any questions.